JNN 19 Oct 2014 GAZA : Israeli authorities continue to restrict the access of Palestinians to the al-Aqsa Mosque in the occupied West Bank for the third consecutive week. Israeli police have deployed nearly 1,000 soldiers and erected several roadblocks around the holy Islamic site in East al-Quds (Jerusalem). The site has been the scene of clashes between Palestinian worshippers and Israeli settlers and troops in the past few weeks. At least 1,300 Israeli settlers and hundreds of soldiers have forced their way into the compound in the past ten days while thousands of Palestinian Muslims under the age of 50 have been barred from entering. 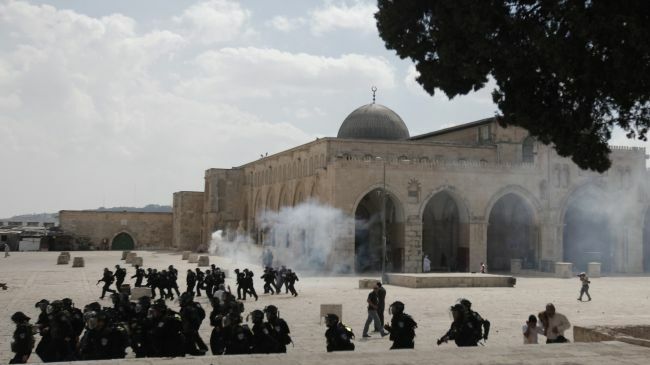 Last week, scores of Palestinians were injured in clashes with Israeli forces inside the al-Aqsa Mosque compound. On Friday, Palestinian President Mahmoud Abbas called on all Palestinians to use “all means” necessary to protect the al-Aqsa Mosque from Israeli settlers, arguing that Israelis have no right to desecrate the holy compound. The al-Aqsa compound, which lies in the Israeli-occupied Old City of al-Quds, is a flashpoint holy site in Islam. The location of the compound, known to Jews as the Temple Mount, is the holiest site in Judaism. The mosque is Islam’s third-holiest site after Masjid al-Haram in Mecca and Masjid al-Nabawi in Medina. This entry was posted in Middle East and tagged al-Aqsa Mosque, israel, Israeli settlers, Palestenian, palestinian president mahmoud abbas, Palestinians. Bookmark the permalink.